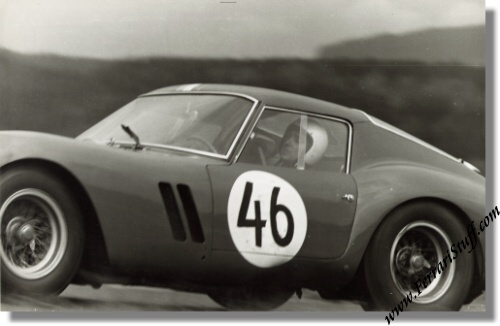 Vintage 1963 photo of Ferrari 250 GTO S/N 3943GT at the Nurburgring 1000 KM. This is a vintage 1963 photo of the Ferrari 250GTO of Pierre Noblet which he drove to First-in-Class & 2nd overall with Jean Guichet during the Nurburgring 1000 KM race. I believe it is Pierre Noblet in the picture but I am not entirely sure. The photo measures some 24.5 x 16 cm or 9 x 6 inches and is in mint condition.